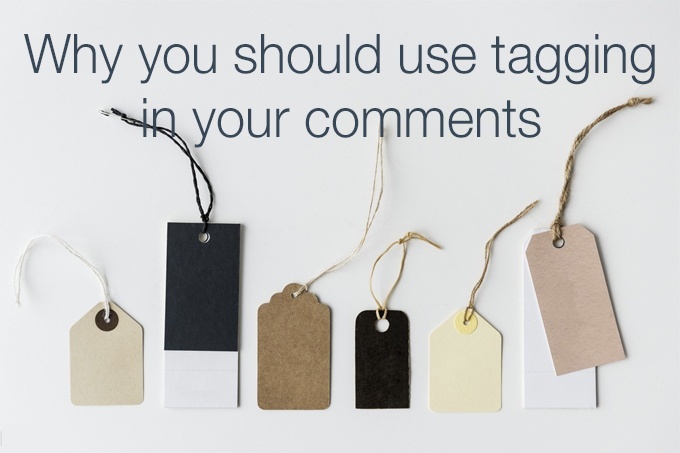 Tagging is used to identify someone in a post, photo or comment within social media. It is also used to draw someone's attention to a post, photo or comment because their name has been added to it. This is how tagging works best with comments. This is a great way to increase exposure, grab attention, get a reply or a share, and increase the purpose or reason for commenting in the first place. Too busy to read all of this now? Click here to read it later. Of course a lot of what I say in this infographic could also be used for posts and photos too. It's just a matter of adapting it accordingly. Tagging is altruistic in nature. Whenever you use it, you're always thinking of someone else. Very rarely would you use tagging for your own ends. For example, you come across an interesting post, and you think of someone who would be interested in reading it. You tag that person within your comment. Doing this produces an alert, which will direct them straight to your comment (and the post). Or you read a report or come across a review of a book written by someone you know. You tag that person in the comments to give credit where it's due. This draws more attention to that person, allowing others to visit their profile and find out more about them. The most obvious place to use tagging is in Facebook. People are probably doing this without realising it. Whenever you start to type someone's name, Facebook offers up suggestions and you choose the correct name you need. This also happens to photos through face recognition (from their avatars). Be careful when doing this, and make sure you choose the right person to match the face. Tagging in comments to draw attention to it. This makes certain people aware of your comment to allow them also to have their say. Whenever you use someone's username with the @ before it, it becomes a tag. This process alerts that person to your tweets. You already know using @usernames at the beginning of tweets answers directly to the person. However, this is only seen by the recipient. If you want to allow other people to see your tweet with the tag, make sure at least one character (eg a full stop or period) is before the @username. Twitter tagging can also be used for acknowledgement or to give credit to interesting content. This is done by adding 'via @username' at the end of the tweet, and the author will know you've retweeted their post and will respond accordingly. Similar to Twitter, you add an @ before the username. It allows you to reply to the Instagram's author in your comment, to tell them how much you enjoyed their photo. It can also help towards making the photo more attractive to other passing viewers, as tagged comments tend to be more visible (and intriguing). LinkedIn calls tags 'mentions' (they like to be different!). It is a way of letting people know you are talking about them. Similar to Facebook, you start typing @name and LinkedIn will offer various suggestions for you to choose from. A published a LinkedIn mention notifies the recipient so they can find out why it has been used. This allows people to know you've commented on their post, so they are then able to write a reply. Mentions also invite people to view another person's profile to spread goodwill, such as recommendation suggestions, acknowledgement purposes or enabling further contact. Tagging is a kind gesture to get others involved in what you're doing, draw attention to content or create awareness of an event within social media. It is a way of spreading relevant information to people who would be interested and would find value from it. Tagging makes a comment more noticeable, as it shows others may be interested in it, it obviously isn't spammy or useless, and it highlights the fact it contains content worthy of reading. Recommended posts and updates tend to be attractive as their popularity is infectious to both passing visitors and the search engines. And tagging encourages relationship building through responses and replies, reciprocal tagging for other content, and stimulating liking, sharing and referrals within other posts. Combined with strict relevancy, this increased activity also helps with SEO and page ranking. Start a tagging strategy now! Whenever you read a post or update on social media, obviously you should leave a comment. But why not go a step further and think who else would be interested in this content. Tag that person to draw their attention to it. Do this enough and they will start tagging you to information you may also find interesting. This is a great way of altruistically publicising posts to a variety of different audiences throughout social media. This to-ing and fro-ing of tagged contact is a great way of creating a business relationship, attracting the attention of influencers to you, and allowing you to show who you are and your expertise within your chosen industry or niche. Tell me your successes, and failures, in your tagging activities in the comment box below. We would all benefit from reading about them. And remember to share this post on social media and tag people who you know would be interested in reading it. This is a great way of increasing my reach to different audiences. Great info…reciprocity were you meaning rather than reciproacy at no9. ? Ah, yes, thanks for pointing out my spelling mistake. At least it proves you’ve read all of my post!